If you’re a business owner, you have to make a lot of difficult decisions with regard to where to advertise your business and how to position your brand. Thankfully, many websites, directories, and social networking platforms are completely free for anyone to use. If you could only pick one off this list, Facebook would be the wise choice. The popular social networking site has 1.35 billion active monthly users now — a number that was hovering below 250 million only six years ago. Aside from being able to position yourself in front of a large chunk of the world’s population, Facebook enables you engage with customers in unique ways and even implement effective and highly targeted PPC ads. While Twitter can boast of only a fraction of the monthly active users of Facebook, it’s still a very effective resource and a site every company should seek to be represented on. All credible businesses have a Twitter profile; it’s useful for distributing content, sharing links, and engaging in one-on-one conversation with customers. What started as a crowd-sourced database in 2007 is now the most comprehensive collection of startup activity and data on the Internet. Park View Legal’s Crunchbase page is a good example of how a company can best utilize this networking site. For startups and small businesses in particular, this is an excellent location for attracting investors and piquing interest in your industry. For businesses that sell physical products, Pinterest is an extremely valuable resource. It allows you to showcase your products and encourage social sharing far beyond what was previously possible. When you launch a Pinterest page, make sure you don’t focus simply on self-promotion, but try to curate products and ideas that might appeal to your target market, as well. The experts have been inclined to gloss over Google Plus, but you shouldn’t make that mistake. It’s an incredibly powerful platform and should be utilized by every business that’s interested in increasing its visibility and credibility. In fact, anything that Google promotes is something you should give a try. If only because it’s connected to the de facto search engine leader, you’d be wise to make their products a priority. That being the case, if your business thrives on local customers or local search, you need a Google Places listing. That will enable you to show up high in the search rankings, enhance your credibility, and allow for social reviews and ratings. You should regard the Internet as a massive and complex map. 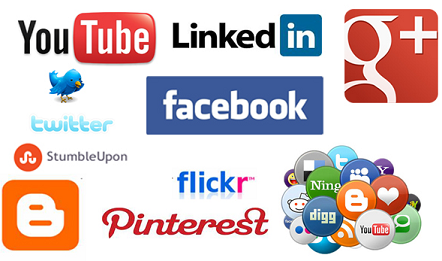 Each website, directory, and social networking site is like a parcel of land or building on the map. It’s up to you to find valuable real estate and claim it. In this case, most of that real estate is free and simply waiting to be occupied. While the sites listed above are the most important, dozens of others are available to you. Always be on the lookout for new marketing opportunities so you never stop enhancing your brand’s online visibility.